Just looking at it you can see it is a tree form covered in leaves, however since I did learn a few small tips for making this little topiary thing (is it is a topiary?) I thought I would share them since they will save you a little trouble if you want to make one. First, the supplies: The leaves are from Dollar Tree. It took me less than a full package to make one 14 inch tree. I used a foam tree form from the craft store. You could use a rolled piece of poster board like I used for my pom pom trees. Then you aren't limited to a certain size. Look at that.. the are covered with dollar store pom-poms.. I’m seeing a trend here! I am thinking of making a couple more of these and having a little leaf tree forest. They would be super cute in a little grouping on a side table or on the mantel! Are you getting ready for fall yet? 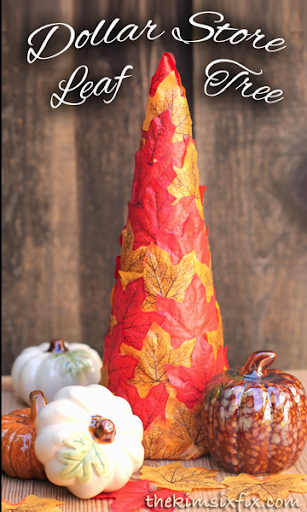 I’d love to hear about your fall craft ideas in the comments.